With the beauty industry swamped with new eyelash brands weekly, it can be hard to discern quality from the newest mass-market products. And who has time to scour for hours online looking for the perfect set of eyelashes? 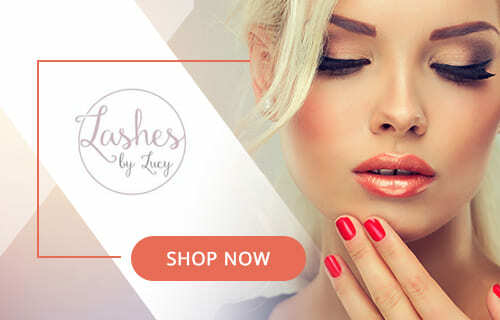 Have no fear, Lashes by Lucy is an up and coming false eyelash brand ready to solve all your eyelash dilemmas. Whether you are a first-time user or a beauty guru, you can discover a large variety of choice on their website. But be quick – their featured 3D Mink collection sells out fast with its 12 unique lashes to choose from, made so you can perfectly tailor your look. With each eyelash pair reusable up to 25 times, you won’t break the bank trying to create your own signature beauty look. If you need some inspiration, check out their Instagram @lashesby.lucy, where you’ll find a variety of different styles previewed. Whether you are a girly girl or not, it is hard to say no to a fabulous pair of lashes! The benefits of wearing false eyelashes are pretty exhaustive, which is probably why the falsies industry has shot up in popularity over recent years, with more of us than ever dying to get our hands on some fluttery additions! One brand that is killing the lashes game is Lena Lashes. Based in Louisiana, this U.S. brand seems to understand how difficult it can be to find that perfect pair of lashes, so they offer a wide variety of premium options to cover all the bases. Having more recently branched out into other cosmetic areas, their website has started to offer a couple of other products such as liquid lipsticks, highlighters, and brow kits. Lena Lashes do a range of both synthetic and mink lashes, so for those of you who want to stick to an all cruelty-free brand, this may not be the one for you. However, the website does state that their mink lashes are free from dyes and that no harm is imposed on the animals, so it comes down to customer preference. Along with the return of the accentuated, black-fringe look that was made famous by Twiggy in the 60s, false lashes have become the go-to trend accessory. And they aren’t just for special occasions anymore; many people enjoy using them every day. These days you get several different types of falsies, and some are more noticeable than others. There are also plenty of different brands on the market which can make your decision-making process – when it comes to false lashes – rather confusing. One of the most well-loved brands of fake lashes currently on the market is KoKo Lashes. They offer over 60 styles of fabulous lashes, ensuring that there’s something for everyone. Handmade with either high-quality synthetic fibers or authentic human hair, they’re reusable and offer incredible comfort. Their best sellers are KoKo Lashes Queen Bee, Goddess, Stella, and Amore. In this KoKo Lashes review, we will explore this fabulous and exciting brand of falsies. Tatti Lashes has taken the makeup industry by storm, gaining a strong following on Instagram with over 200,000 followers currently, and numerous celebrity endorsements, customers are falling in love with these falsies. Blending luxury quality with affordability, it’s understandable why it’s not difficult to begin adoring these false eyelashes. Tatti eyelashes are made of three materials for versatility and variety; human hair, cruelty-free silk, and 100% real mink fur. Whether you do or do not buy products made from animal materials, Tatti Lashes has something to offer for everyone, and their selection of revolutionary collections also helps to expand upon this diversity. The right pair of fake eyelashes can produce a world of difference, amplifying the natural beauty of the eyes and enhancing your luminous facial features in all the right places. It is even more pleasant when the lashes you love are actually inexpensive because you know that you are getting your money’s worth while achieving the desired effect. In this review we’ll walk you through our favorite products from Tatti Lashes, along with an overview of their company, ending with a specific rating for a list of criteria. Knowing where to buy false eyelashes can be overwhelming if you’re thinking of buying falsies for the first time. The lash industry has suddenly blown up and is now absolutely huge, and with so many brands out there it can be extremely hard to choose. False eyelash products on the market range from cheaper options to pricy mink lashes, and they come in all sorts of shapes and sizes. How on earth are you supposed to pick?! Luckily, we are here to help. This is a complete, updated review of J.Cat Beauty and their line of false lashes. If you want to know all about the JCat Beauty falsies, how much they cost, and where to buy them, then read on to discover everything you need to know about JCat Beauty lashes. Artemes Lashes scream exclusivity, whether that’s their A-list clientele or their pro-membership requirements – it’s hard to tell. Intrigued? It seems there has been nothing but good press about this brand, they have even appeared on Rita Ora’s ‘Must Have Beauty Products’ in 2015. Everyone is wearing Artemes Lashes, whether its Chrissy Teigen’s appearance on The Late Show or Gal Gadot rocking the style Love Shady at Comic-Con – if they are good enough for superwomen, they are good enough for us all. But high quality is truly at the heart of this brand. Passionate about luxury or as the website describes ‘superior craftsmanship’, Artemes uses the finest mink hairs in all their products. This creates an ultra-soft and durable quality, which enables you to wear their eyelashes up to 25 times. In fact, each eyelash takes over two days to complete because each hair is placed individually on the band. Artemes Lashes are the definition of quality over quantity.